General Antonio Lopéz de Santa Anna sent a report to Mexico City on the afternoon of March 6, 1836, just hours after his troops captured the Alamo. 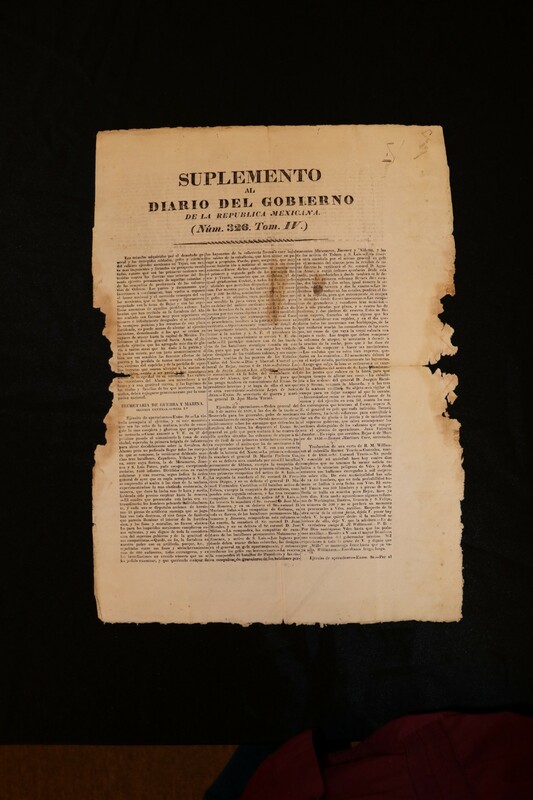 This report, along with his battle orders and General Urrea’s report of his successful campaign to reclaim the area below Goliad, were published in the Suplemento al Diario del Gobierno de la Republica Mexicana (Num. 326. Tom IV). This artifact is an important piece of not only Mexican history, but also Texas and U.S. history. While Santa Anna reported on the storming and fall of the Alamo, he also sent the flag of the New Orleans Greys captured at the battle as proof that foreigners were involved in the conflict. Included in his dispatch was a letter from Robert McAlpin Williamson to William B. Travis, telling him to hold on because help was on the way. This document sheds light on how the Texas Campaign was progressing in Texas from the view point of the Mexican government.